Because the sky’s the limit, we offer drone technology to provide you with a neighborhood flyover of your prospective Scottsdale luxury gated home. We’re dedicated to providing you as much information up front as possible. Aerial views can be hard to get but are extremely valuable as you initially review and consider all aspects that determine whether a Scottsdale gated luxury home bears further consideration. We make it easy to get the lay of the land without ever being inconvenienced. When you identify a home you’re interested in, we’ll send our camera equipped drone on a neighborhood flyover so you can clearly see the surrounding area. It’s simple and gives you a great sense of not only the exterior of the house or property but also the community in which it resides. Some people make a home purchase solely on what their home looks like, only to find later the surrounding community didn’t meet their expectations. 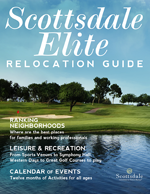 Because what’s around your Scottsdale luxury gated home is as important as what is inside, viewing the surrounding community will help you refine your search and build your shortlist. Drone technology is just one of our wide range of resources and yet another example of concierge service going to great heights to provide exceptional convenience and access to optimize your Scottsdale luxury gated home buying experience.